Tickets available from SISTIC website. Organized by Composers & Authors Society of Singapore (COMPASS), Singapore Chinese Cultural Centre (SCCC) and Ocean Butterflies Music, “SG:SW 2018 I Write The Songs” is a Nationwide Mandarin-Pop Song Writing Festival, providing a platform to uncover local music talents and cultivate the next generation of original music talents. Out of the 354 songs received this year during the open call submission, 12 finalists’ songs will be performed at the Finale Concert. The finale will be judged by renowned songwriters/producers including Liang Wenfu, Lee Si Song, Zennon Goh, Lou Nan Wei and Derrick Hoh. To encourage songwriters for writing more original songs, the Organizers will present 6 awards (not in any particular order) during the Finale Concert: Best Song Award, Lyrics (Merit) Award, Melody (Merit) Award, Best Vocal Performance Award, Popularity Award (Public Voting) and Best Band Performance. Special performances include local artistes Joanna Dong and MICappella. The event will be graced by Ms Sim Ann, Senior Minister of State, Ministry of Communications and Information & Ministry of Culture, Community and Youth. 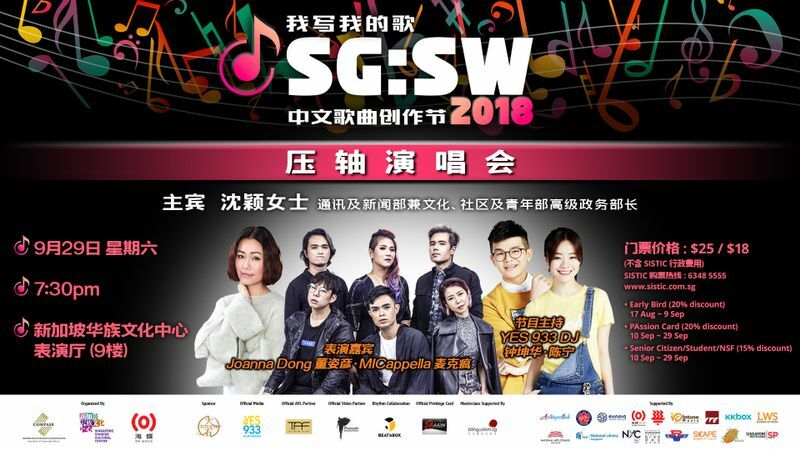 Grab your tickets to “SG:SW 2018 I Write The Songs” Finale Concert now from SISTIC!